News in the biotech sector often leads to large price moves in the stock of the company. This can, of course, mean a move up or down. If the news for the drug is good, the stock tends to move up. Bad news can push the stock lower. This is a normal reaction. The news can have an important impact on the company’s future cash flow. This fully explains the market move. It’s information that is important to the market and the market, under the Efficient Market Hypothesis, immediately discounts that information. Some traders worry that they missed the initial move and the stock no longer presents an opportunity. While it is true that they have missed the initial move, it is not true that there are no additional opportunities. That’s the case for Global Blood Therapeutics, Inc. (Nasdaq: GBT). “Voxelator, a once-a-day oral drug, works by increasing the binding of oxygen to hemoglobin, the molecule that carries oxygen in red blood cells. Global Blood thinks this would help prevent patients’ red blood cells from clumping together, which would decrease the risk of stroke for those patients. That means there could be increased volatility in the stock. The longer term chart below shows that volatility could be to the up side and additional gains could be possible. However, as with any volatile stock, there is a risk that the stock could move in the opposite direction of what a trader believes is likely. That’s why it is important to focus on risk and the risk can be controlled with many strategies. 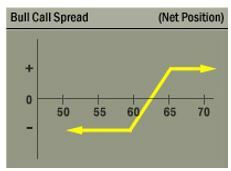 This makes options strategies, in particular strategies known as spreads, especially appealing. These strategies offer a trader limited up side potential and strictly defined down side risks. Again, GBT offers an example. As with the ownership of any stock, buying GBT could require a significant amount of capital and exposes the investor to standard risks of owning a stock. For GBT, the December 21 options allow a trader to gain exposure to the stock. A December 21 $50 call option can be bought for about $1.92 and the December 21 $55 call could be sold for about $0.90. This trade would cost $1.02 to open, or $102 since each contract covers 100 shares of stock. In this trade, the maximum loss would be equal to the amount spent to open the trade, or $102. For this trade in GBT the maximum gain is $3.98 ($55 – $50 = $5.00; $5.00 – $1.02 = $3.98). This represents $398 per contract since each contract covers 100 shares. Most brokers will require minimum trading capital equal to the risk on the trade, or $102 to open this trade. That is a potential gain of about 390% based on the amount risked in the trade. The trade could be closed early if the maximum gain is realized before the options expire.